Closed End Funds or CEFs are traded like stock. It is traded in variety of global stock exchanges like New York Stock Exchange (NYSE), NASDAQ, etc. One of the CEFs categories is High Yield Bond Fund. You will find the top performer high yield bond closed end funds such as Pacholder High Yield Fund, PIMCO High Income Fund, Credit Suisse High Yield Bond, etc. 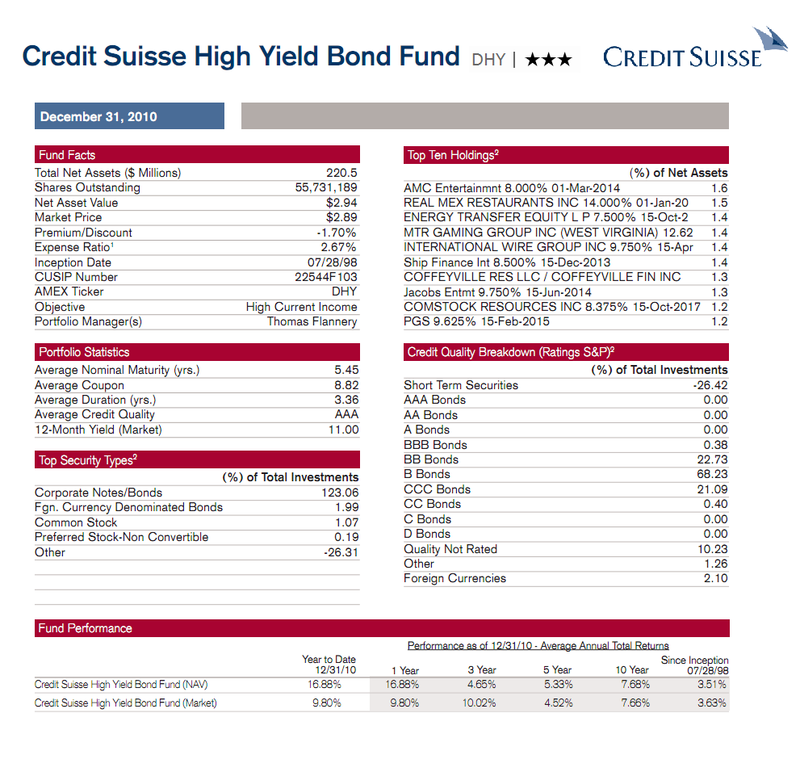 You may also find my latest article, Top 10 High Yield Bond Closed End Funds of 2012. 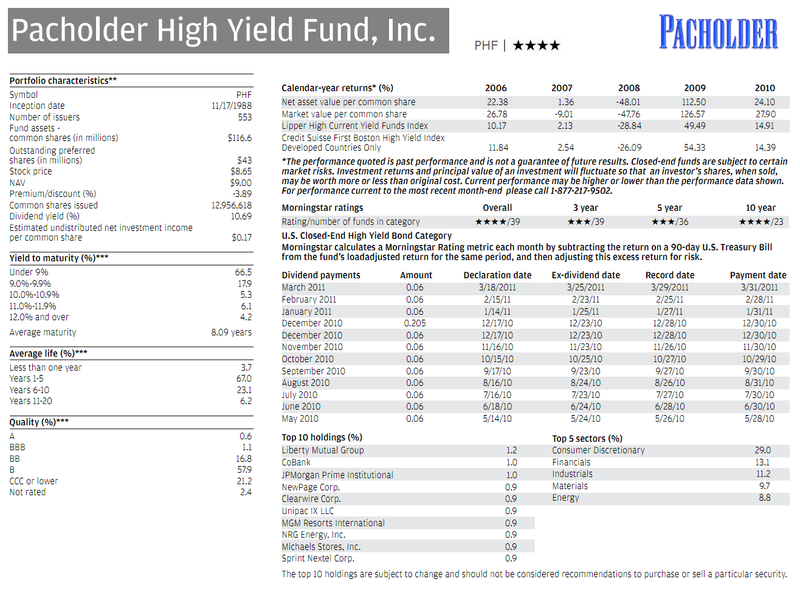 As the top performer high yield bond CEF (YTD: 17.63%), Pacholder High Yield Fund seeks to a high level of total return through capital appreciation and current income. The fund will invest most of its asset primarily in high yield lower, rated fixed income securities of domestic companies. The fund’s sponsor is J.P. Morgan Investment Management Inc.
As of April 2011, the fund’s top 10 holdings are Liberty Mutual Group, CoBank, JPMorgan Prime Institutional, NewPage Corp, Clearwire Corp, Unipac IX llc, MGM Resorts International, NRG Energy Inc, Michael Stores Inc, and Sprint Nextel Corp. The top 5 sectors are consumer discretionary (29%), Financials (13.1%), Industrials (11.2%), Materials (9.7%), and Energy (8.8%). The fund also pays a dividend of 8.7% per year. This dividend is paid monthly and recently it has been increase from $0.06 per share to $0.07 per share. While famous for its bond mutual fund, PIMCO also provides variety of bond closed end funds. The PIMCO High Income fund objective is to provide high current income and capital appreciation. This PIMCO fund will invest most of its asset in corporate debt obligations and income producing securities. This is also one of the largest high yield CEFs in term of asset with $1.58 billion. The fund charges 1.24% annual expense ratio. The fund is managed by Bill Gross, the legendary bond manager, since 2009. The fund market price is traded at 49.7% premium from its fund’s NAV, this is a significant premium compare to other high yield bond fund. This fund also receives 2 stars rating from Morningstar. As May 2011, this PHK fund yield is 10.29% per year. This dividend is paid monthly. Since its inception, the fund market price has returned 14.07%. As of April 2011, the fund top 10 sectors are insurance life (21.7%), miscellaneous (19.8%), banks (18.8%), non captive consumer finance (17.2%), electric utility (8%), non captive div finance (5%), insurance P&C (4.9%), wirelines (1.3%), airlines (1.2%), and automotive (1.2%). The fund consists of 349 bonds and it has 4.45 years average duration. 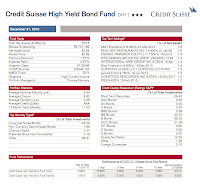 As part of Credit Suisse Asset Management fund, the Credit Suisse High Yield Bond fund seeks high current income through investment in non investment grade US fixed income securities or debts. The fund is managed by duo managers, Michael Gray and Martha B. Metcalf. This closed end fund current total net asset is $302 million. The fund also charges 2.09% annual expense ratio including 1.55% baseline expense and 0.53% interest expense. 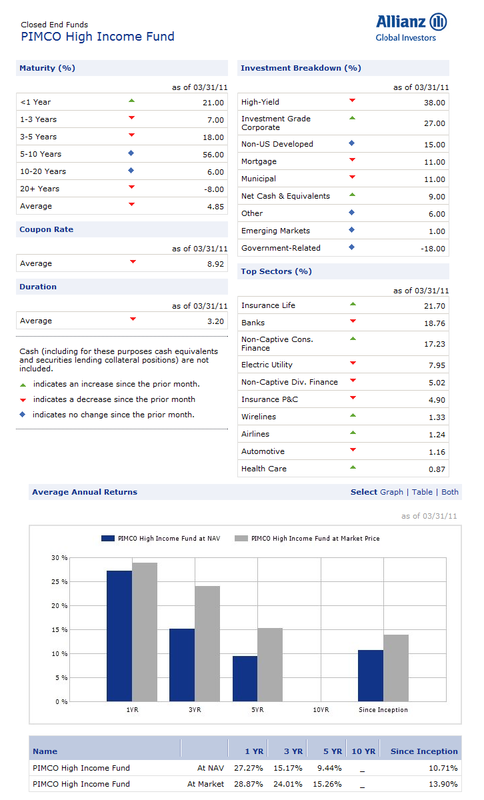 The fund market price is traded at 4.85% premium from its NAV. It also has 3 stars rating from Morningstar. This high current yield fund market price has returned 33.31% over the past year and 8.56% over the past 5 year. The year to date performance is 15.11% (until May 6th, 2011). The fund top ten holdings are AMC entertainment, Real Mex Restaurant Inc, Energy Transfer Equity LP, MTR Gaming Group Inc, International Wire Group Inc, Ship Finance, Coffeyville Res llc, Jacobs Entertaintment, Comstock resources Inc, and PGS. As of November 2011, the top 5 sectors are High Yield Corporate bond (91.9%), Short term debt (10.1%), General Debt (2.9%), General Equity (0.8%), and Preferred shares (0.14%). The Pioneer Diversified High Income fund seeks high current income with capital appreciation through investment in preferred stocks, floating rate loans and insurance linked securities. The fund net asset is $237 million with 27.35% effective leverage. The annual expense ratio of this Pioneer fund is 2.23%. Since May 2007, this fund has been managed by Andrew Feltus, Charles Melchrit, and Johnathan Sharkey. The fund market price is traded at 7.33% premium from its fund’s NAV. This fund also receives 4 stars rating from Morningstar. As May 2011, the fund yield is 8.52% per year. This dividend is paid monthly. Part of this dividend is return of capital (ROC), about 17%. Since its inception on May 2007, the fund market price has returned 9.91%. As of April 2011, the fund top 5 sectors are high yield corporate debt (40.90%), bank loans (24.6%), emerging market / international high yield (27.3%), event linked / cat bonds (15.9%), and commercial mortgage backed debts (1.7%). The fund consists of 420 bonds and it has 3.30 years average duration. 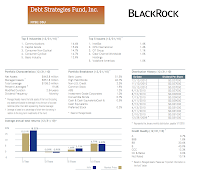 The BlackRock Debt Strategies Fund objective is to provide high current income to investor. 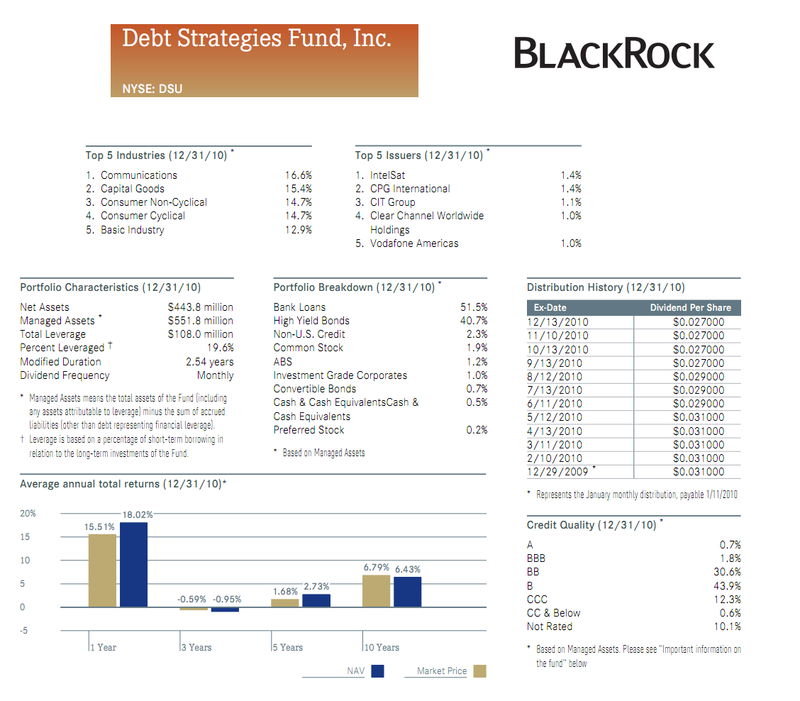 This BlackRock closed end fund invests in lower rated corporate debt instruments (junk corporate bonds). The fund is managed BlackRock Advisor. This fund was formerly known as Debt Strategies Fund. The expense ratio of this BlackRock fund is 1.23% per year. It also has an effective leverage of 20.16%. The fund has returned 21.89% over the past year and 2.69% over the past five year. This fund is rated 2 stars by Morningstar. As of January 2011, the top 5 industries are communications (16.6%), capital goods (15.4%), consumer non-cyclical (14.7%), consumer cyclical (14.7%), and basic industry (12.9%). Top 5 debt issuers include IntelSat, CPG International, CIT Group, Clear Channel Worldwide holdings, and Vodafone Americas. This fund has 362 holdings in its asset. The modified duration of this fund include 2.54 years. Note: As discussed above, you can trade these CEFs using your brokerage. For best brokerages, please check my latest Best Brokerages 2012 page. more funds on my next article. For part 2 article, please check Top Performer Junk Bond CEF Part 2.